CHRISTMAS PARTY SANTA CALL – LIVE PARTY SANTA CALL! NOTE: DID YOU MAKE PAYMENT? IF NOT DO SO HERE NOW. YOU WILL BE RETURNED TO THIS PAGE AFTER PAYMENT. IF YOU DID – SELECT A CALL DATE AND TIME BELOW. Live Santa Party Call. Having a school, daycare, company party, church, or live holiday event? Let Santa Claus call your party, or event for a LIVE talk with the kids at your event or party. 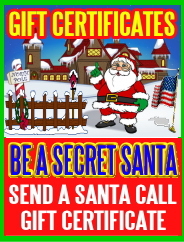 * Free Santa Call Magical Web Page to share with party goers after via social media. * Free MP3 Audio Recording of the call as a keepsake to share with families and kids. * Live telephone talk with all the children at your event and more. Reserve your call DATE and call TIME from those still available. Fill out the form at the bottom with your personal details. Hit Submit and watch for a Pending Confirmation emailed soon after. You are redirected to Santa’s Questionnaire to supply details about your event and kids. Once done submit form, and watch for a Booking Confirmation emailed with call info. Ready to Reserve a Live Christmas Party Santa Call? Use the form below and select your reservation date and time now, then follow the steps above to make the $99.00 payment. Reserve your LIVE party, class, church, office, or family Party Santa Call date and time below. After you are sent to make payment for your LIVE Santa party call. NOTE: CALL TIMES ARE EASTERN TIME! PLEASE DO NOT RESERVE A TIME IF YOU ARE NOT READY TO PURCHASE NOW. RESERVATIONS MUST INCLUDE A PAYMENT AND QUESTIONNAIRE AFTER BOOKING. RED DATES ARE FULLY BOOKED! Have Questions? Please call us at 1-970-223-3659.